In the 21st Century, excessive weight gain is an imperious curse since people are indulging only in a sedentary lifestyle. Lack of exercise and poor diet plan are the prime factors of an unhealthy status and dearth of nutritious elements is another cause, too. However, if you take adequate omega-3 fatty acids with your diet, you can shed extra pounds and lead a healthy life with ease. What do You Know about Omega-3 Fatty Acids? Going by the definition, omega-3 fatty acid is a type of unsaturated fatty acid primarily found in fish oils. Saturated fatty acids have single bond and chocolate, red meat, butter, cream, and eggs contain a high level of saturated fats. Polyunsaturated fatty acids or essential fatty acids contribute to metabolism and keep your body healthy. 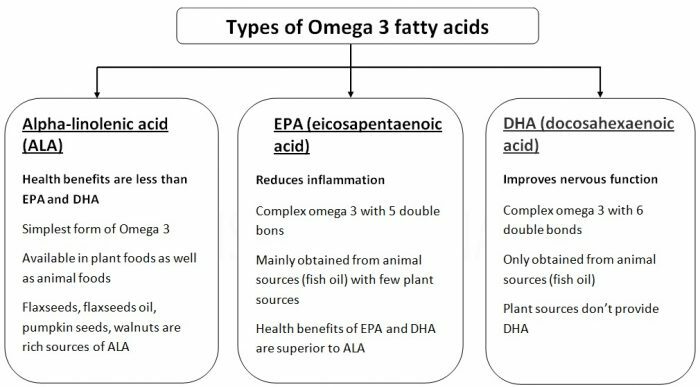 ALA or alpha-linolenic acid, DHA or docosahexaenoic acid and EPA or eicosapentaenoic acid are three chief omega-3 fatty acids that provide a high scale of health benefits. The human body lacks the functionality of producing ALA; hence, you can only acquire this component from plant oils like canola oils, soybean, and flaxseed. Nevertheless, the body has the potential to manufacture EPA and DHA in a small amount from ALA. These fatty acids are integral parts of human membranes which cover every cell in your body. DHA levels are abundantly found in sperm cells, brain, and retina of the eye. Boosting energy level with calories, the omega-3s help in improving roles of the immune system, lungs, heart, endocrine system. Additionally, the component has a significant role in regulating body fat. Naturally found in nuts and seeds, fishes and seafood, fortified foods and plant oils, omega-3s are essential for human beings. There are omega-3 dietary supplements such as cod liver oil, krill oil, algal oil and fish oil. If your body detects a deficiency of this essential fat, you can suffer from swollen and itchy rash and red, scaly and rough skin. Vision problem and eye discomfort are the causes of dry eye disease which is a result of lack of omega-3 fatty acids in the body. If an individual gets more of DHA and EPA, the person can lower the risk of symptoms. Dietary fiber, minerals, vitamins and other dietary nutrients along with omega-3s can show the effective result in eye problems. Apart from dry eye disease, elderly people suffer from vision loss which is a result of age-related macular degeneration. Food ingredients enriched with omega-3s are capable of reducing the chances of developing AMD. A wide range of seafood and fatty fishes are included in the healthy diet plan for saving your heart from many diseases. DHA or EPA has the capability of reducing the triglyceride level and omega-3 dietary supplements are highly effective in this scenario. Few of the studies suggest that the omega-3 fatty acids can minimize the risks of colorectal cancer and breast cancer. However, more research on this topic can give a sanguine result because the link between carcinogenic cells and omega-3s are not exactly clear. The undertaken clinical trials are likely to examine and find the possibility soon. Stiffness, swelling, loss of function and chronic pain in the joints are common causes of rheumatoid arthritis. Omega-3 dietary supplements contribute to managing RA and its symptoms along with helping in associated treatments. The current studies indicate that you can actually lose weight if you take dietary supplements loaded with omega-3 fatty acids and workout daily. The University of South Australia chose 75 overweight and obese people who had been fighting with high cholesterol level, cardiovascular diseases, and hypertension. These people were divided into four groups and the half of the first group was given sunflower oil (contains no omega-3s) and the other half took tuna fish oil (contains omega-3s). After splitting the groups, one half did 45-minutes run at 75% heart rate every week. After 21 days, the group taking tuna fish oil and following exercise was able to shed a certain amount of body fat and an average 4.5lb weight. The other group showed little change but it was not as significant as the group consuming tuna fish oil. 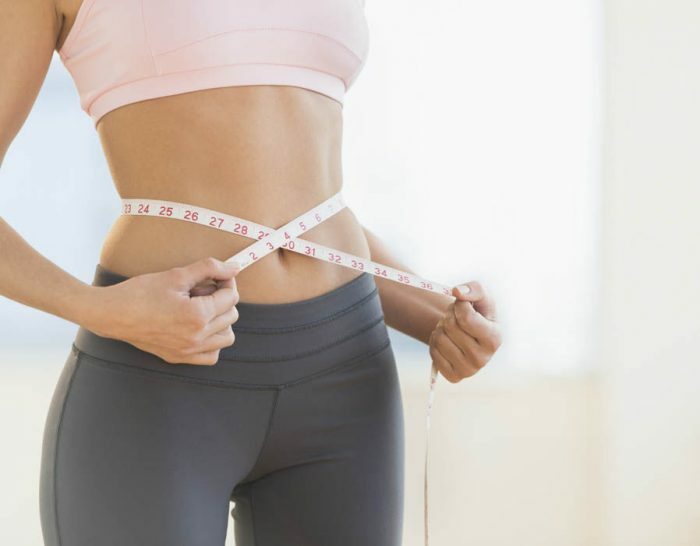 Moreover, the group losing weight quickly did not bring any other change in their daily diet plan. The effect of fish oil on weight loss was substantiality evident. Omega-3 oil has the capability of increasing the blood flow at the time of exercising. The fatty acids stimulate enzymes that convert fat where it is burnt for producing energy. Even if you do not like fish or seafood, you can consume grass-fed beef that also has a low ratio of omega-3: omega-6. In addition to the context, specific types of cheese, milk, and eggs also can fulfill the lack of essential fatty acids in your body. You are generally introduced with the saying that fat adds extra pounds to your body weight but it is different when you consume omega-3 or omega-6. Annual Meeting of the American Study for Children Nutrition considered women who have a low amount of calories in their diet for indicating that omega-3s increased elimination from adipose tissues. During the fat-burning process, omega-3 fatty acids play a major role in beta-oxidation for breaking down fat cells. Reducing glycemic level in the meal and regulating insulin spike, consumption of essential fatty acids is important. The whole amount of calories extracting from fat in a regular diet should not cross the limit of 20%-35%. Omega-6 and 3 fatty acids make sure that your diet plan has the required level. Moreover, the ideal ratio of omega-6 and omega-3 should be in between 2:1 and 3:1. Nevertheless, at present, the ratio is around 8:1 to 12:1 in the American diet. As said earlier, fish oils are rich sources of omega-3s and people can manage appetite and hunger by including oily fishes and seafood in their diet. One of the studies refers to the fact that people following a healthy diet have consumed less than 0.3 g or more than 1.3 g of fish oils containing essential fatty acids. The group taking omega-3s got the full feeling even after two hours of the meal. Another study implied that the group consuming fish oil perceived 20% less full after having a normal breakfast and a strong desire to consume something. Placebo worked more efficiently than the fish oil that the patients with renal disease or cancer consumed. One of the studies had an interesting insight that omega-3s enhances the level of hormone which gives out the feeling of fullness. However, the non-obese people noticed that the levels of such hormone dropped, making them hungrier. 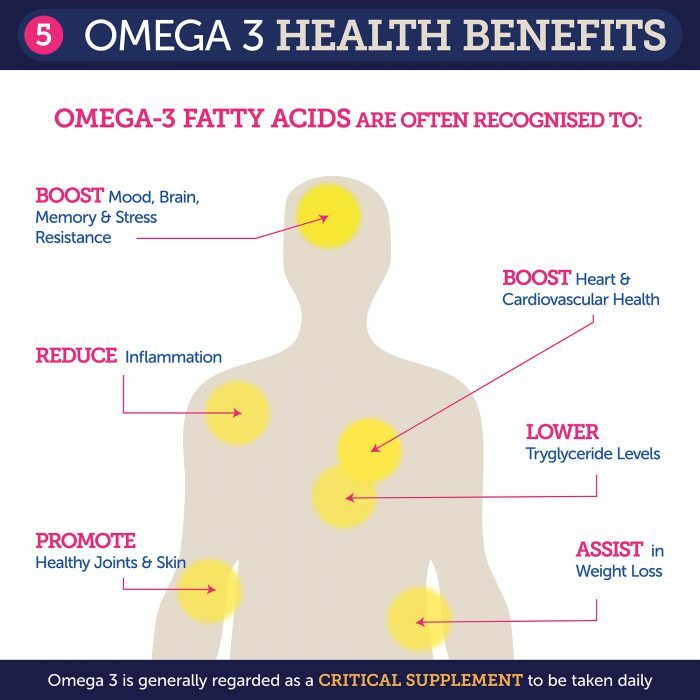 Henceforth, it can be discerned that omega-3 essential fatty acids work more perfectly on the people dealing with obesity. Omega-3 fatty acids are essential in losing body fat and building strong muscles for people who are burdened with woes of obesity. The measured weight can be misleading; thereafter, it is important to keep an eye on the body fat percentage by checking progress instead of taking help of the scale. One study chose 44 people and they were recommended to take 4g of fish oil on a daily basis. Furthermore, these people were not able to lose more body weight than those taking placebo or dummy pill. But the result was far more interesting as observed later. People who consumed fish oil managed to form 1.1 more pounds and shed 1.1 more pounds of fat than the people who did not choose to take fish oil. Another study had six adults having normal body weight and they were suggested to replace 6g of fat with 6g of fish oil for three consecutive weeks. The weight remained stagnant but the individuals ended up losing more fat stored in the body. Few researchers imply that the adults may not lose more body weight with fish oil effectively than they can with placebo. However, fish oil is hugely beneficial for the people struggling to reduce belly fat or waistline. One of the popular ways to reduce weight is to increase metabolism and omega-3 fatty acids contribute effectively to it. The higher your metabolic rate goes up, the faster you can manage to cut down extra pounds limiting you to sport your new party dress. A study refers to the situation that when a young adult following a healthy diet may take 6g of fish oil containing omega-3s for 12 weeks constantly. The person can observe that he/she has been able to improve the metabolic rate by 3.8%. Nevertheless, a recent version of the study indicates that individuals having taken 3g of omega-3s dietary supplement managed to enhance metabolic rate by 5.3%. Another study indicates that older women (adding healthy foods in their diet) consumed 3g of fish oil daily for 12 weeks and noticed that metabolic rate was increased by 14%. This portrays the picture that these healthy and older women were able to burn an additional 187 calories every day along with omega-3s. If you wish to get back a toned figure following routine exercises along with a healthy diet, you should focus on these foods enriched with omega-3 fatty acids. Take a handful of walnuts for sprinkling them on your cereals or salads to get your daily intake of omega-3 fatty acids. Rich in protein, vitamin D, phosphorus and omega-3 fatty acids, salmon can reduce weight along with the risks of high blood pressure and heart attack. Sardine is another great choice which you can add as pizza or sandwich topping for your snack. Offering vitamin B12 and B6, mackerel contains a decent amount of omega-3 fatty acids. Canola oil has low saturated fat which is highly advantageous for everyone’s health. Having a huge scale of dietary fibers, minerals, vitamins along with omega-3 fats, chia seeds are highly recommended by the healthcare providers. Soybeans are considered in having ALA that can promote healthy heart when it is cooked in low temperature. The omega-3 dietary supplements generally do not have any adverse effects on human health; however, there may be few side-effects. Diarrhea, indigestion and other gastrointestinal symptoms are common problems. Again it is not certain whether people having seafood or shellfish allergies are able to consume fish oil without suffering much. You should consult with the healthcare professional before taking omega-6 or 3 dietary supplements because the bleeding time may be extended. Hence, if you take nonsteroidal anti-inflammatory drugs or anticoagulants, you should discuss this concern with your doctor. There is a difference between cod liver oils and fish oils. Omega-3 essential fatty acids along with vitamin D and A are abundantly found in fish liver oils. However, if you consume these two ingredients on a large scale, the result can show toxic effects. Moreover, there is an ongoing debate on whether omega-3s extracted from seafood can be an underlying cause of developing prostate cancer. You should always remember that consumption foods laden with omega-3 fatty acids can never decrease your waistline. The diet should focus on 5-10 servings of veggies and fruits including nuts, beans, and peas. Drinking enough water and maintaining a workout routine are other important ways to shed extra kilos in an efficient manner.